Cillín Hill is a retail hub just outside Kilkenny City. 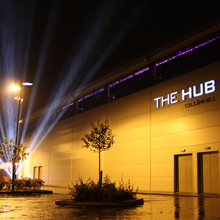 The modern striking architectural building, contains a total of 13 office units and 8 retail units and is part of a wider complex which includes “The Hub” event centre, “Kilkenny Mart” and the business and retail park. There are also a number of purpose built meeting and conference rooms. NLCE were appointed as M&E service engineers in the development of this site. We also provided fit-out services to retail units on site including the National Car Testing Centre and FBD Insurance Brokers.